Eight and Sand presents “Dearly Belated” by Alexandria Sandlin. In her solo show, Sandlin will highlight conceptual ideas that have been floating around like ghosts, waiting to come into being. Equinox Studios presents Tamara Clammer, Betty Jo Costanzo, Downing Pottery, Beth Gahan, Nicole Kistler, Tabasco Mills & The Iron Monkeys, Jeff Olheft, Seiji Fabrication, M. Anne Sweet, Tandem Fabrications, Claire L Putney, Sophia Wheelwright, and The 1979 Bizarre features a new film, “Growing Corpses”. The Georgetown Artride will get you there and back. Fantagraphics Bookstore and Gallery Jim Woodring presents his new book, Jim! The visionary Seattle-based artist will be available to informally discuss and sign copies of his new anthology, which debuts at the Art Attack. Flip Flip Ding Ding! presents 3D Paper Dioramas Of Classic Videogames by Jonathan Roulston, with a series of classic video games crafted into 3D paintings. Each piece is carefully cut out and layered in the frame to bring the characters to life. Georgetown Liquor Co. will feature Lampoons and Word Balloons by Marty Gordon who refers to viewing his work as peeking through a window into another world – a place where art, humor, faith, tension, and candidness all harmoniously coexist. 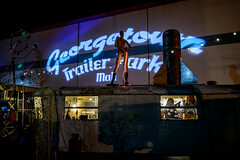 Georgetown Trailer Park Mall Sylvia O’Stayformore hosts the 3rd Annual Trailer Park Drag Strip with live music by The Moonspinners, Less than Equals & DJ Brownstone’s Soul Attack, enjoy cool libations in the Georgetown Brewing Beer Garden! Krab Jab Studios continues its group show, The Dark Woods: The Roots of the Fairy Tale, curated by Satyros Brucato. Drawn from the haunted allure of dense wilderness and primal dreams, this extended show invites you to explore the wilder side of faerie tales, with art that steps off the beaten path, venturing into places where tender hearts don’t go. 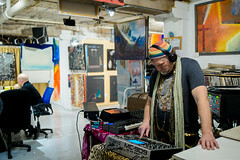 LxWxH Gallery features a pop-up art shop! All small drawings, paintings, and sculpture previously available online will be in the gallery for sale. Spectrum House Salon & Photography presents A Compendium of Curious Creeps by Nick Gucker, an eclectic collection of vintage pulp and weird fiction inspired artworks in ink, charcoal, watercolor & acrylic. Haunted renderings of things that creep, crawl and crouch in the dark corners of space and time – that run, fly and chase through the endless night…and those that just sit and wait. Waxing Impressions will have work by Deborah Stachowic, “Concepts in Art”, featuring beeswax encaustic, acrylic, and watercolor paintings; and paper, clay ,and fused glass jewelry. Jon B. Dove @ Studio E, Allen Williams @ Krab Jab Studios, flyer for Continental Shift @ The Georgetown Castle, Sophia Wheelright @ Equinox (middle image of installation), Trailer Park Drag Strip @ Georgetown Trailer Park Mall, Jonathan Roulston @ Flip Flip Ding Ding, Marty Gordon @ Georgetown Liquor Co. (bottom image), Nick Gucker @ Spectrum House (top), Alexandria Sandlin @ Eight and Sand, Jim Woodring @ Fantagraphics, Deborah Stachowic @ Waxing Impressions. It’s summertime in Georgetown, Seattle! Enjoy a leisurely afternoon browsing through our delightful interior design stores, and stopping for happy hour at one of our many wonderful restaurants. At 6pm, there is still plenty of daylight left for a stroll along Airport Way to weave through our numerous art spaces, ateliers, stores, and galleries.Jump aboard the FREE Art Ride to check out our west end locations such as Equinox Studios and SANCA (see our map for Art Ride bus stops). All City Coffee features a retrospective of all Georgetown Art Attack poster art by Tim Silbaugh. Eight and Sand presents “Icons Of Horror” by Reed Carpenter. Using painting and mixed media, Carpenter explores horror movie icons and ideas that even in the light of day will pull you right back to that feeling you got seeing Jason lumber out of the darkness, and the Cenobites shrouded in darkness. Equinox Studios presents Karl Seng’s light creations, Betty Jo Costanza’s refreshing paintings, John Kirschenbaum’s innovations in stool technology, Beth Gahan’s color crazy fun, Jeff Olhoeft’s stone sculpture, Tamara Clammer and FaceOdd Masks, Tabasco Mills and the Iron Monkeys, Alex Miller holding casting calls for his spooky movie kickoff, and more! The Georgetown Artride will get you there and back. Fantagraphics Bookstore and Gallery presents the work of Eleanor Davis and Esther Pearl Watson for an art show, book signing, beverages, and barbecue. Georgetown Arts and Cultural Center presents “Uncontrolled Beauty” new photography and installations by Seattle native Jacob Smithers. Nature lover and friend of natural untouched decay, Smithers sees the world of decay as a gorgeous beauty to be left alone or celebrated. These images each have there own re-used or found frames that accentuate their image. 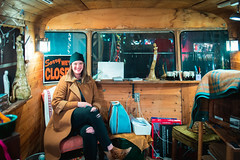 Georgetown Trailer Park Mall: Vintage & Artisan Market features Seattle Public Library’s Pop-up Shop, a glamorous Tupperware Party hosted by the infamous Sylvia O’Stayformore, and the Final Happy Trails Sale at Frida! Krab Jab Studios presents a group show, The Dark Woods: The Roots of the Fairy Tale, curated by Satyros Brucato. Drawn from the haunted allure of dense wilderness and primal dreams, this extended show invites you to explore the wilder side of faerie tales, with art that steps off the beaten path, venturing into places where tender hearts don’t go. LxWxH Gallery will host Cullom Gallery, featuring Ellen Ziegler’sVermilion, a new series of drawings rendered with red transfer paper, an electrically-charged stylus, and gouache applied through punctured stencils. The series is an exploration of unrestrained, intuitive mark making, and embrace of the color’s rich visual power and its many-fold associations to geology, culture, biology, and art history. Machine House Brewery will be combining Art Attack and the Georgetown Garden Walk this month with a show from Seattle garden designer Bob Lilly, “Upside Down Hedge“. 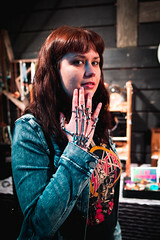 The show will feature experimental ventures in inverted gardening and oil painting. Miller School of Art features “Elva and Rena at School”, abstract acrylic and oil paintings by Elva Francis and Rena Langille expressing color, joy, emotion, and a love of painting. Spectrum House Salon & Photography features both original work and prints from “Nightmares Are Free” – The Weird Art of Jeff Tobin. Fans of unique art will appreciate the strange, surreal, images and unique framing concepts. Studio Sanctum highlights the moody realist oil paintings of Jethaniel Peterka and Kyle Abernethy. Waxing Impressions will have work by Deborah Stachowic, “Concepts in Art”, featuring beeswax encaustic, acrylic, and watercolor paintings; and paper, clay, and fused glass jewelry. Reed Carpenter, Jacob Smithers, Thomas Dodd at Krab Jab Studio (detail of piece), Bob Lily, Rena Langille (detail of piece), Jeff Tobin, Tim Silbaugh, Seth Glover, Elva Francis, Ellen Ziegler, Kyle Abernethy and Jethaniel Peterka.